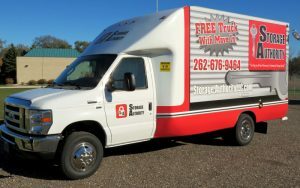 Storage Authority not only offers a free moving truck rental for a day with a unit rental but also rents out the truck for much less than other leading truck rental companies. For only $50/day you will be able to make your move a lot less stressful and a whole lot quicker. Our moving truck rental comes equipped with a furniture dolly and furniture pads to safeguard those precious antiques you might be moving. The truck also comes equipped with a ramp to help load and unload those heavier items. The moving truck also comes with the first 75 miles FREE. If you should go over that 75-mile mark it’s only $.50 a mile after that. All that is required to rent our truck is a valid driver’s license and proof of personal vehicle insurance. Both must be presented at the time of signing. Please note that Storage Authority’s Truck Rental Program is only for local moves. We do not offer 1-way truck rentals. The truck must be returned to Storage Authority in Union Grove, WI. So why choose Storage Authority’s Truck Rental Program over the Nation’s leading truck rental companies? Well to put things plainly, we offer the same great service at a much lower price. National chains charge a fee of $29.99/day for the same size truck. However, they could charge you upwards of a $1.00/mile plus other taxes and fees! You also wouldn’t be able to use furniture pads or dollies for free. Both must be rented at an additional fee. So please call today for more information and to reserve our truck. Spots are limited and it’s first-come first-serve!! Call Today!